Brendan saw these all in Greenacres, a suburb in Adelaide, South Australia. 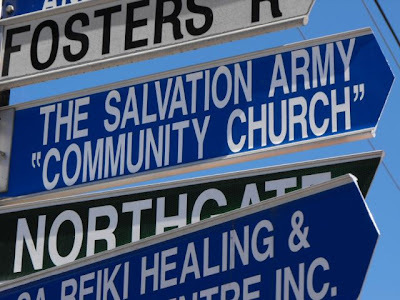 Evidently they have a fake church, a fake park, and just any Oakden Central. Paging Baudrillard. 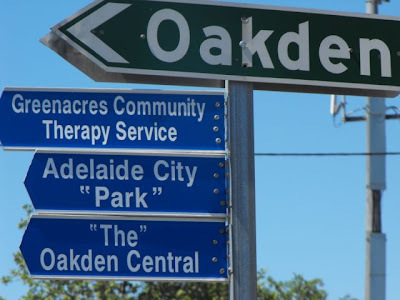 It's actually a church of the Flying Spaghetti Monster, the "park" is simply a giant featureless parking lot, and Oakden was originally known as Oaktheden, I guess? Quotation marks on a definitive article! Priceless! Makes me proud to be "an" Australian. "The" is the greatest one. I'm not even remotely sure what they were trying to do. It was fine when the morons were just limited to pens and markers. Now they have sign-making machines? I can't believe I never noticed that before! I drive past those signs nearly every day! Lol!